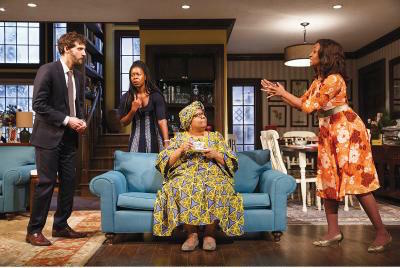 The playwright Danai Gurira so assiduously resists the easy binaries that might seem inevitable in her work—African versus American, white versus black, colonialism versus nationalism—that it almost feels like a disservice to harp on the sharp contrasts between the two fine plays she recently has run on New York stages. But the contrasts are there, and they are striking. If you happened to walk from a matinee of Eclipsed—her searing drama about Liberia at the end of that country’s last civil war in 2003, now showing at Broadway’s Golden Theatre—to an evening performance of her rollicking Midwestern family comedy Familiar, which recently concluded its run at Off-Broadway’s Playwrights Horizons, you might be forgiven for not recognizing them as the work of the same writer. Gurira, who was born in Iowa but raised mostly in her parents’ native Zimbabwe, obviously contains multitudes; she is best known to the wider public for playing a sword-wielding zombie killer on the television series “The Walking Dead.” She also happens to possess both enormous storytelling brio and sobering depth, an irresistible combination. “Eclipsed” might be unwatchably grim without Gurira’s knack for broad strokes and eye for comic detail, while “Familiar” would probably be a grating trifle if it did not rest on a bedrock of empathy. Individually either of these plays would announce the arrival of a promising new writer for the American stage; together they immediately put Gurira, who is 38, in the first rank of working American playwrights. Both plays defy, or perhaps transcend, our initial impressions of them as, respectively, a dutiful war tutorial and a stock immigrant-family farce. In “Eclipsed” we are introduced to the uneasy sisterhood of four “wives,” who subsist in a bombed-out concrete hovel while serving the whims of an offstage commanding officer in a Liberian militia. One of them, Number Two—they address each other chiefly with their ranking numbers—has defected to become an AK-47-toting soldier herself, while the newest arrival, Number Four, receives her conjugal initiation matter-of-factly between the first and second scene. It will not be her first or her gravest loss of innocence. When she later joins Number Two on the rebel lines against the despot Charles Taylor, Number Four faces the harsh flip side of female empowerment through firepower: that in taking up arms she has effectively joined the system of brutal plunder of which she was formerly a victim. That a play full of such hard lessons and matter-of-fact atrocity—mostly described rather than shown, but no less harrowing for that—neither crumbles into cynicism nor quite stirs itself to outraged sermonizing is a tribute to Gurira and her clear-eyed director, Liesl Tommy. But it is also a tribute to an extraordinary cast headed by the mercurial Lupita Nyong’o as Number Four. That the play ends semi-hopefully, with an apparent end to hostilities, is not a comforting gloss. After deposing and exiling Taylor, Liberians subsequently elected Africa’s first female president, Ellen Johnson Sirleaf. A map of another African nation is among the first things we see in “Familiar,” though it risks being swallowed up in the perfectly appointed upper-middle-class living room of a Zimbabwean-American clan as they prepare for the wedding of their favorite daughter, Tendi, to a white human-rights activist, Chris. That the family’s otherwise football-loving, cardigan-wearing patriarch treasures a framed map of Zimbabwe, while his wife, Marvelous, keeps replacing it with a tasteful floral print, is among the early signposts of the explosive conflict to come. And while it puts some well-worn themes in contention—assimilation versus heritage, tradition versus individual expression—“Familiar” would not be half as entertaining as it is if it did not also put a group of well-observed, idiosyncratically human characters in contention as well. At the extreme edges, these include Chris’s plain-spoken brother, Brad, and Tendi’s harrumphing Aunt Anne, on hand from Zimbabwe to perform a traditional roora negotiation in addition to the couple’s Christian wedding. At the center would seem to be Nyasha, Tendi’s sister, a singer/songwriter chafing at her role as the family’s black sheep. But among the saving graces of Gurira’s play is that our sympathies are regularly scrambled and reshuffled. While she is not above some broad, goofy, crowd-pleasing gestures, not to mention some shocking revelations that skirt melodrama, she garners neither laughs nor gasps at her characters’ expense. In short, Gurira’s is not a landscape of heroes and villains, or of tidy final solutions. A blessed comfort with complication and nuance is among the threads that unite her plays, bold-faced as they are in outline. Even “Eclipsed,” which paints a justly damning portrait of the amorality of war, finally refuses to judge the most obvious onstage antagonist, armed-and-dangerous Wife Number Two, a k a Maima (played by Zainab Jah). Like Mother Courage in Brecht’s great antiwar classic of the same name, Maima is both a product and an agent of human cruelty. That there are alternatives to the depravity she represents may be heartening enough to get us through another day, but that should not let us off the hook. To anyone with open eyes, the eat-or-be-eaten world Maima embodies and embraces looks distressingly familiar. This article also appeared in print, under the headline "Shades of Gray," in the April 18, 2016 issue. Rob Weinert-Kendt, an arts journalist and editor in chief of American Theatre magazine, has written for The New York Times and Time Out New York. He writes a blog called The Wicked Stage.